Duane Allman is justly lauded for his work with his Brothers, but there’s more to the legacy of the doomed guitarist than At Fillmore East. Duane Allman: letting it slide. At Fillmore East might be his most cherished legacy, but it was the seven notes Duane Allman contributed to the opening salvo of Eric Clapton’s Layla that made the young guitarist a rock icon. As it turned out, Duane played on much of 1970’s Derek & The Dominos album Layla And Other Assorted Love Songs, but it’s his timeless guitar riff and slide playing on the title track that’s most memorable. Pickett’s track was born at Rick Hall’s legendary Fame studios in Muscle Shoals, Alabama. Duane was only 22 years old when he found himself working at the studio as a session musician. Fame produced sides for Atlantic Records, and Duane was on call when the label’s queen, Aretha Franklin, visited the small town. His slide playing on Franklin’s stunning cover of The Band track The Weight is sublime. Yet the track that caught Clapton’s attention almost didn’t happen. Pickett still wasn’t convinced. It took some unsubtle persuasion from Duane to seal the deal: “What’s wrong? You don’t got the balls to sing it?” That was the last straw for Pickett. He begrudgingly cut the song, an automatic smash as Duane had predicted. 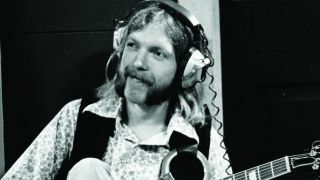 As a musician, Duane Allman was a spiritual cat who, while infamously fuelled by alcohol and drugs, was always in touch with the power of music: “Miles Davis (early Miles) and John Coltrane and Robert Johnson, Junior Wells, Muddy Waters; see, you get a goal in mind, a note that you want to hit with your band and then you gotta go out on the road and your spiritual battery runs down. You get home and you listen to that stuff and say ‘Ah, there it is, I have it before me, I know what to do’, and you go out and do it.